...because every child deserves a summer at camp! Is your MySummerCamps or KidsCamps listing feeling listless? Here are a few tips for whipping it into shape for the season! Maximize your visual opportunities - Upload eye-catching photos of your camp facilities and showcase happy campers engaged in the best activities your camp has to offer. And even a short video can have a huge impact! Update your dates and rates for the season - Parents will move on if they don’t think your session info is current. Use your description to sell your camp - Highlight what makes your camp different than others and mention multiple locations if you have them. Parents love options! Keep the length reasonable - not too long, not too short. Also, using relevant keywords will help your listing gather traffic from search engine searches. Design a custom logo - Our size restrictions can make your logo look illegible when shrunken. Try creating a logo just for our sites that will entice parents to view your listing. 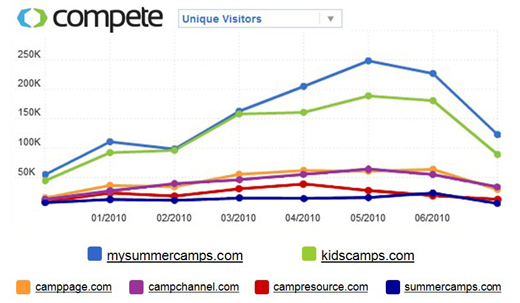 If you’re not currently advertising with us, you’re missing out on millions of parents looking for summer camps. Contact us at 1-877-777-7738 to put these strategies to work for you. Here’s to a successful camp season for everyone! Welcome to 2011! It's February, which means camp enrollment season is upon us. Parents will be coming to our site in droves this month to plan early for the summer. Last month, the number of parents & campers visiting our sites doubled from where it was in December, and it will continue to grow exponentially now through June. Are you ready? This is the perfect time to take a look at your MySummerCamps and KidsCamps listings and expand your marketing efforts to maximize return. Update your camp description with detailed session dates for 2011 and add any new features or selling points for the season. Upgrade your listing level or add additional categories to increase exposure to the millions of parents who will be looking for camps. Contact us today at 1-877-777-7738 or [email protected] or [email protected] to discuss these and other advertising strategies. MySummerCamps and KidsCamps dominate the camp marketing field, which makes us your best partners for reaching parents and campers online. Just look at how we compare to our competitors! So gear up for the new year with MySummerCamps and KidsCamps. Together, we can make the 2011 camp season the best one ever! Keep camp details up year-round - Rather than take down registration info after the season ends, keep details posted so potential customers can see what next year might look like. Add a note stating that the season is over, but new dates will be posted soon. Parents who find a site without any details will simply move on. Invest in online advertising - "If you build it, they will come" does not apply. Just because you have a website doesn't mean parents will find you. Camp directories, Facebook ads, and online display advertising on relevant sites are low-cost ways to drive traffic to your camp Web site. And more traffic means more campers! 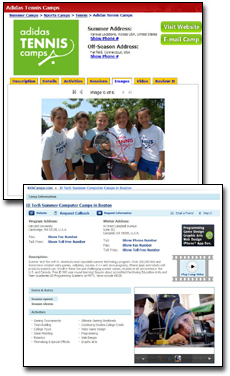 Use multi-media to showcase your camp - A photo gallery gives parents a visual taste of camp activities and facilities. Flip video camcorders start at $149 and can be used to create and post videos to your site. The better glimpse you can give parents, the better chance you'll have to sell your camp. Install Google Analytics - Google Analytics is a free service that can generate detailed statistics about your site, including how people found it, which sections are the most popular, and much more. Tracking these details can help you determine where to emphasize your advertising dollars in future seasons. Display contact information prominently - Post your camp phone number, email, and address on every page or make sure a link to a "Contact Us" section is well-displayed. Making it easy for parents to reach you with questions and concerns is vital. Keep the design simple and easy to navigate - Skip flashy gimmicks like an animated splash page and open with important basics like camp dates and locations. Also, include a map that shows where your camps are located. A site that delivers information in a clear, straightforward manner is the best way to sell your camp. Offer multiple ways to register - In addition to online registration, offer alternatives such as a phone hotline or a downloadable form that parents can print out and send. More options makes enrollment easy and accessible for all parents. Create an email marketing list - Collect email addresses & send out notices when camp enrollment opens or to announce special events. Include anyone you've ever received an inquiry from, even if they didn't attend. Refreshing people's memory throughout the year ensures your camp will be on their radar as they plan for next summer. Include an FAQ - Answer all those questions you've been asked repeatedly in the past, including questions about meal options, activities, bunk setup, etc. Providing answers to common questions will save parents time and help them make an informed choice more quickly. Give parents a take-away - A printable brochure (PDF) or one-sheet that includes your URL and contact info will help people find their way back to your site later. This page is an archive of entries from February 2011 listed from newest to oldest. March 2011 is the next archive. Copyright © 1995 - MH Sub I, LLC dba Internet Brands. All rights reserved.